Nintendo attempts to control the internet! 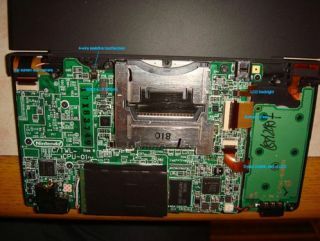 The insides and gizzards of Nintendo's new DSi - WARNING: Do not try this at home, kids! Nintendo's recently released DSi console's parental controls block access to over 35 million 'inappropriate' websites, it was revealed by the console giant's network security partners this week. The DSi packs in cloud-based internet filtering tech from security specialists Astaro. Concerned parents (or, at least, those ones that are even aware that the DSi allows their kids to access the internet) can adjust the DSi browser settings to turn Astaro's filtering service on. Astaro's service works as a remote web-proxy server to limit web browsing, capable of blocking over 35 million websites. Gert Hansen, Astaro's Chief Security Architect, said the technology uses an "enterprise-class content filtering technology", he added that it was fast and "unobtrusive for users". "The scalability of the service which is being offered is crucial," he added. "By hosting the service in the cloud, we can provide a full security service to Nintendo DSi users." Nintendo Europe MD Laurent Fischer said: "Web access enriches how the Nintendo DSi can be used but we understand the need for security parameters. "Astaro's service provides a powerful level of support to our users and is a valuable part of the new features within the Nintendo DSi." Of course, most net-savvy kids and teenagers will most likely figure out how to override Astaro's blocking service around ten seconds after their concerned mum has left the room. Such is the way of the world.